Posted by markus on 2010/11/21 . Leave a comment. 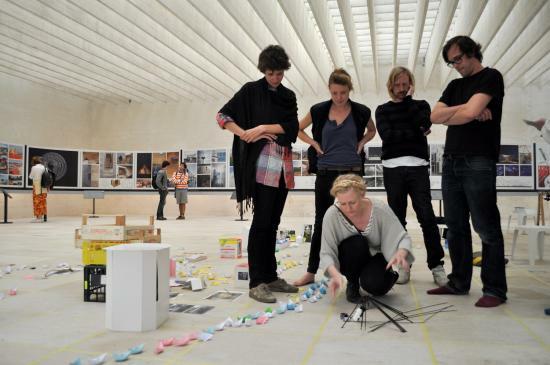 We were recently invited by Testbedstudio and Economy to participate in the At Work With residency programme within the Nordic Pavilion at the International Architecture Biennale in Venice. Fabulous, we thought! The At Work With project was conceived of as a kind of complement and counterpoint to the main – and rather controversial – Stay in Touch exhibition commissioned by the Swedish Museum of Architecture. 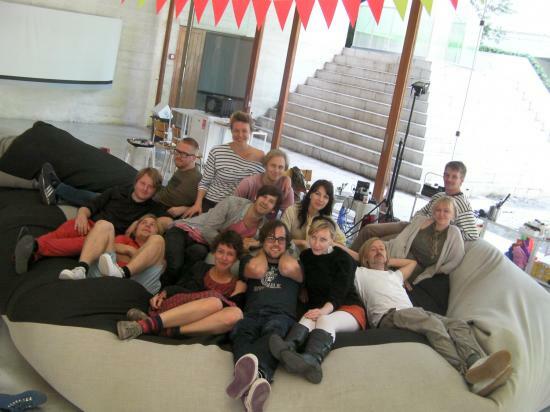 As a “social practice” made up of shifting mix of friends and strangers, Svensk Standard’s team for At Work With in the end constituted 13 people – ten architects, one political analyst, one urban planner and one engineer. Larger than ever before, and with thanks to funding from IASPIS (the Swedish Visual Arts Fund’s international programme), we negotiated time off from our professional practices and flew to Venice, to take over Sverre Fehn’s incredible pavilion for the space of a week. 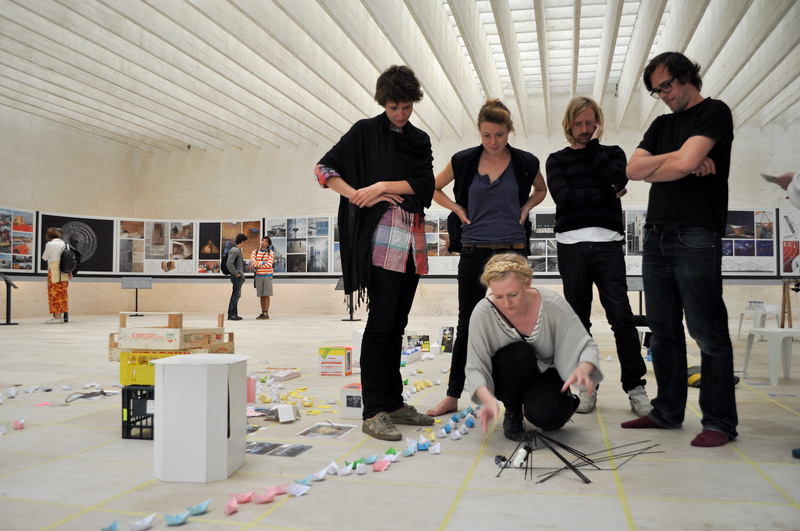 Working in a large interdisciplinary group necessitated the formulation of a structure that would be able to contain and relate our work – a kind of vessel. As we explored potential lines of inquiry we realised that our curiosity in itself was a common characteristic. We all had myths in our heads about Venice – a dying city, sinking; a tourist city, drowning – and about the Biennale, which we all wished in some way to prove or disprove. We chose to describe our project as “archaeology”, working independently to “dredge” the city for artefacts, myths and phenomena and transport them to the pavilion in order to map the reality we found. Some of us very literally trawled the waters of Venice. Others used mechanical animation to bring forgotten objects to life. Others made a thousand paper boats with the visitors to the pavilion, echoing the original industrial output of the Arsenale. Some disproved myths and others created them, and all the while we tried to keep to the simple rule of one project per day per person, presented publically in a group presentation at the end of each day. 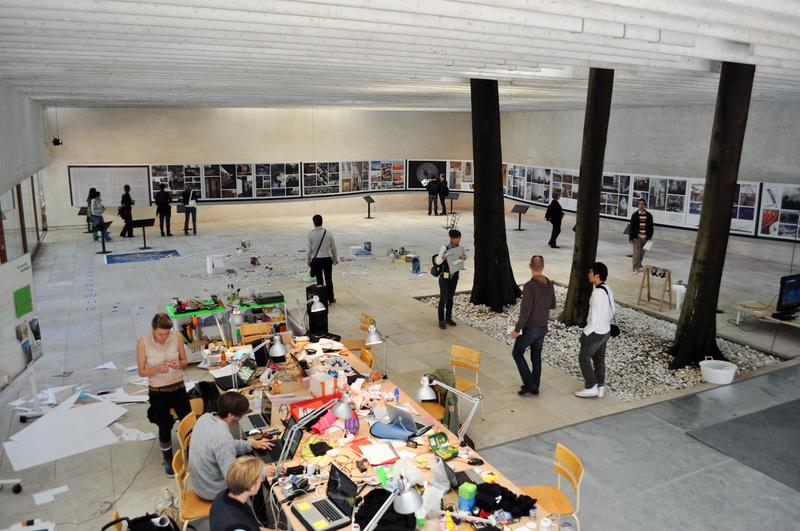 Documentation of our work is presented through the At Work With blog. Project by: Helen Runting, Markus Wagner, Joél Jouannet, Rutger Sjögrim, Karin Matz, Sara Liberg, Anders Berensson, Daniel Johansson, Ola Keijer, Martin Łosoś, Fredrik Andersson, Caroline Ektander and Bree Trevena. Previous post: Venice! of the North!